Steve Reeves stars in a classic pirate adventure for director Umberto Lenzi. R2 Impulso Spanish DVD. Sandokan was a character created in a series of novels in the late 1800s by Italian writer Emilio Salgari which became enourmously popular although were little read outside of Italy. His books were adapted into films in the 1940s and 1950s, before this adaptation co-scripted by director Umberto Lenzi. 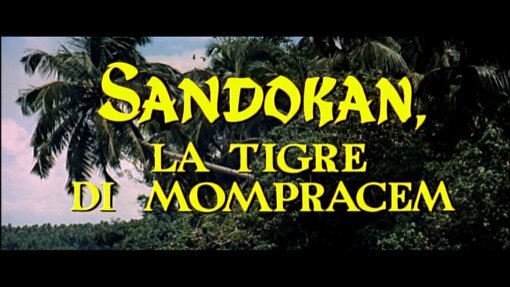 The storyline is based on the first of the Sandokan novels The Tigers of Mompracem although the only real element retained from Salgari's original text is the idea of the pirate falling for the young niece of a British officer, the invented storyline is however still able to capture the swashbuckling adventure of the novels (with the noticable exception, presumably budget related, of any pirate ship action). The start is a little shakey - when we first meet Sandokan and his small group the dialogue is very unclear on just what is going on and why. We learn nothing of the origin of the character, nor of his western friend Yanez, probably because it is anticipated that most of the audience would already be familiar with the characters and their storylines. As you would expect from an adventure film, the plot as a whole is quite simple, but more than enough to keep the film moving and the action scenes never seem forced or gratuitous. Pacing is good and to film builds up to a large scale climax. Italian director Umberto Lenzi would later become famous for his crime and cannibal movies, but earlier in his career he made a number of adventure films and here he is able to demonstrate a solid talent for direction. He is aided immeasurably by the fact that the film was shot on location, largely in Sri Lanka, giving the exterior scenes a real authenticity that no amount of stock footage could duplicate. A good cast of extras is on hand for the climactic action scenes and again the location shooting means that we are spared the embarrasment of seeing white actors "blacked up". Composer Giovanni Fusco, best known for his work with Michelangelo Antonioni, provides a solid if largely unnoticed soundtrack. Top cast was one of the biggest names in European adventure films at the time, the big American Steve Reeves. Although more at home in classical Greece and Rome, he had previously starred in Morgan il pirata (1960) and certainly looks good here with plenty of chance to show off his surprisingly good acting skills as well as his fight scenes. A number of familiar Euro-cult faces, including Rik Battaglia (Amanti d'oltretomba (1965)) show up in the rest of the cast and acting is generally strong. Once you get over the slightly confusing start, Sandokan the Great is a highly enjoyable adventure movie with some great actions scenes, another superb leading performance from Reeves and some beautiful location shooting. One for all classic adventure movie fans and a must-see for Steve Reeves fans. Generally recommended. Any gore or violence? A little blood but the fight scenes are of the traditional swashbucking mold rather than violent. Who is it for? Fans of Steve Reeves and of classic adventure films will certainly enjoy this. For most of the runtime, the print is very strong with superb detail and colours. Several scenes do however drop into a lower quality print with some noticable compression issues although fortunately these are relatively short and still watchable. Audio English, Castellano and Catalan. The Spanish tracks drop out during one brief scene towards the end of the film which is in English with forced Castellano subs. Subtitles Castellano for the English language audio. Availability Spanish release, retail title Sandokan. Available on its own or as part of a Steve Reeves pirate film boxset, along with Morgan il pirata and the Sandokan sequel I pirati della Malesia neither of which include English options. Other regions? Available on a very low quality disc in the US. Cuts? Cut status unconfirmed. The print used is Italian language. A highly enjoyable adventure film with a typically fine Steve Reeves leading performance. Recommended. For the most part a superb looking DVD and even with the quality drop it is always watchable. All text in this review written by Timothy Young - 18th July 2010.